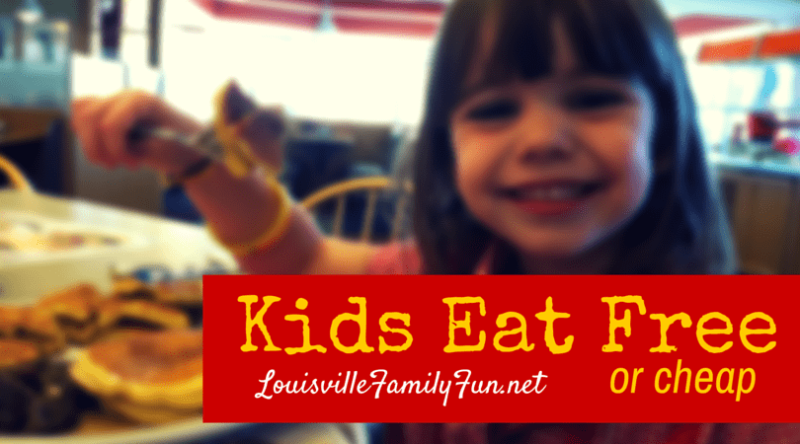 Here’s a list of kids eat free places in Louisville & Southern Indiana that offer specials for kids! Love deals? Click here to see our page for other family fun deals. Please check with the restaurant before going as many change their deals! Let us know if you see a new place that we don’t have listed or if you know of one that changed their deal! In Oldham County? See this list – click HERE. Follow Louisville Family Fun on Facebook! Bearno’s (Westport Rd.) – Kids eat free. Dine in only. Mon – Weds. Bistro 42 – One free kid’s meal with purchase of an adult entree. Christie’s Cafe – Free kids’ meal with purchase of an adult meal. 4 – 9 p.m.Gustavo’s (All locations) – Kids meals are $2.99 on Mondays. 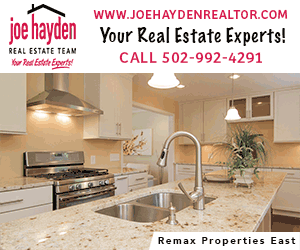 Cox’s Hot Chicken – New Albany & Jeffersonville locations – dine in only. Frisch’s Big Boy – Free kids’ meal (12 & under) with adult meal purchase. Hometown Pizza – Free kids’ individual one-topping pizza or kid’s spaghetti dinner with the purchase of any medium or large pizza at regular menu price. Dine in only. Mondays and Tuesdays. Macaroni Grill – One free kid’s meal with the purchase of an adult meal. All day Monday & Tuesday. McAlister’s Deli – Free kid’s meal with the purchase an adult meal. Dine in only. Monday – Thursday. 4 p.m. – close. Mellow Mushroom St. Matthews – Kids eat free with adult entree purchase. Molly Malone’s (Highlands & St. Matthews) – Kids eat free with purchase of an adult meal. 4 – 8 p.m.
O’Charley’s – Free kid’s meal all day every day. One kids meal per adult entree. Drink not included. Texas Roadhouse St. Matthews – Table crafts, games and $1 OFF kids’ meals. The Spaghetti Shop (New Albany) – Free kids meal with purchase of a full size adult entree. Dine-in only. W.W. Cousins – Free kid’s meal with the purchase of an adult meal. 4 p.m. – close. Monday & Tuesday. Zeggz Amazing Eggs – Kids eat free weekday mornings, 7 – 9 a.m. with purchase of an adult entree. Applebee’s – All day, one free kids meal per adult entree purchased. Bob Evans – Kids eat free with purchase of adult entree. 4 p.m. – close. Chick-fil-A Glenmary – Free kid’s meal (excludes 6 pc) with purchase of a value meal. 5 – 8 p.m.
Chili’s – All local Louisville Chili’s offer kids eat free all day on Tuesday. Citizen 7– Free kid’s meal with purchase of an adult entree. Tuesdays and Wednesday. Dundee Tavern – Kids eat free with adult entree purchase. Fazoli’s -3 kids eat for 99 cents with purchase of adult entree. 5 – 8 p.m.
Finn’s Southern Kitchen – During lunch and dinner hours, one free kids meal per purchase of adult entree. Home Run Burgers – Family Night. 1/2 Price burgers and dogs. KingFish (KY & So. IN) – $1 kids meals. Up to two per adult meal purchased. Dine in only. Loui Loui’s – Kids 10 and under eat free with purchase of adult meal. Mark’s Feed Store – All locations. Kids eat free with purchase of an adult entree. Mercato Italiano Trattoria and Market– Kids 12 and under from the kids menu. Mr. Gatti’s Pizza (Outer Loop & Dixie Hwy) – $1.99 Kids’ Buffets and 99¢ Kids’ Drinks every day, Thursday, May 24 through the end of summer 2018. Old Chicago (both locations) – Kids meals or kids make their own pizza for $1.99. 4 – 9 p.m.
SnoWhat Snoballs: Receive a free Kids Cup snoball with the purchase of any regular size snoball! Coloring sheets, bubbles and outdoor games too! Valid through June 26, 2018. Texas Roadhouse Clarksville and Middletown: Kids eat for $2.99 at Clarksville and $1.99 at Middletown with the purchase of an adult meal. (Shively offers Kids’ Night on Mondays). Zeggz Amazing Eggs– Kids eat free weekday mornings, 7 – 9 a.m. with purchase of an adult entree. Adrienne & Co. Bakery Cafe– Kids eat free with adult meal purchase. 10:30 a.m – 3 pm. Bungalow Joe’s – Kids eat free with purchase of adult entree. 5 p.m. to close. Clucker’s – 99 cent kid’s Chicken Ring Basket with adult entree purchase. Firenza – Kids eat free from kids’ menu with purchase of adult pizza. Lady Jayne’s – Free kids’ meal with purchase of an adult meal. Logan’s Roadhouse – Kids 12 and under, 1 free kid’s meal with purchase of adult meal. McAlister’s Deli – Free kids’ meal with the purchase an adult meal. Dine in only. Monday – Thursday. 4 p.m. – close. Señor Iguanas One free kid’s meal with the purchase of an adult meal. All locations. Topp’t Handcrafted Pizzas + Chopped Salads – Kids eat free with the purchase of any full size pizza, salad, or wrap. Hideout Pizzaria – Get a free kid’s pizza or spaghetti with the purchase of a medium or large 2-topping pizza. O’Charley’s – Kids eat free all day every day. One kids meal per adult entree. Drink not included. Joe Huber’s – One free kids’ meal (11 and under) with purchase of adult entree. June 2 – August 25th. Not valid on holidays. Mr. Gatti’s Pizza (Outer Loop & Dixie Hwy) – $1.99 Kids’ Buffets and 99¢ Kids’ Drinks every day, Thursday, May 24 through the end of summer 2018. .
Steak and Shake – One free kids plate for every $9 spent! Age 12 and under. All day, every day. Dine in only. Firehouse Subs – Kids eat for 99 cents with purchase of an adult meal. O’Charley’s – Free kid’s meal all day . One kids meal per adult entree. Drink not included. Pizza Place at Hike’s Point – Kids 8 and under, free kids’ meal with adult meal purchase. Tumbleweed Southwest Grill – One free kids meal per adult meal purchased. Dine in only. Published April 19, 2012. Updated 2/1/19 It is the reader’s responsibility to verify the deal as a restaurant may change or drop their program any day! If you know of a restaurant that has changed or added a “Kids Eat Free” option, please email info@louisvillefamilyfun.net and let us know!Information included in this list may not be copied in part or it’s entirety without crediting and linking this website as an original source.